I purchased this for an amoire that I have converted into a bar in a client's dining room. The look is great. The green on the outside was a little fake, so as a designer, I tweaked it a little. I bought the 1.5 inch no overflow pop up drain in brass with antique finish and it will work. Hopefully, as the inside copper darkens it will look better. There really isn't one with any vendor I have ever found that is a perfect match with copper sinks...you do have to purchase the drain stopper separately, there is not one that comes with the sink. I am using a delta faucet with this in vintage bronze as it has copper brush stokes and ties in with the inside copper of the sink, especially as it ages...we do not want the bright copper look...one of the great things about this sink is we can fill it with ice and use it to chill wine during a dinner party. While the base is 16, the top is about 13 or 14 inches. The handles give it a nice custom look. Sinkology Exceeding all expectations is the Noble 16" Copper Vessel Sink. This handmade copper vessel sink's design originates from the first copper cauldrons ever found. 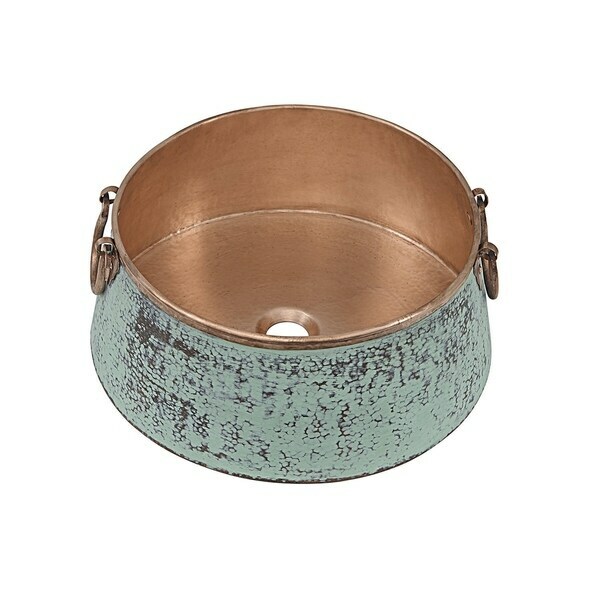 The Nobel Copper Sink features pure copper handles and delicately applied copper Verde exterior finish. The interior is left naked and unfinished, allowing the copper to age naturally with time. Designed to be a bold focal point in any bathroom, the Nobel Naked Copper Sink is a showstopper. Outer Dimensions: 16" x 16" x 7.25"
Inner Dimensions: 15.75" x 15.75" x 7"
Dimensions 23.0 In. X 21.0 In. X 12.0 In. This sink was bittersweet! It's so unique I wanted to keep it but the "patina" was overdone and I knew I'd have to sand some off or? so it wasn't soooo bright blue. It was also HUGE for its purpose so with sadness I returned it. Really special for the right project! "Will the drain handle a garbage disposal?" "We already have the faucet and drain set up on our sink - we just need the bowl. Does this vessel sink have a wide enough drain hole to accommodate 2.5"?"